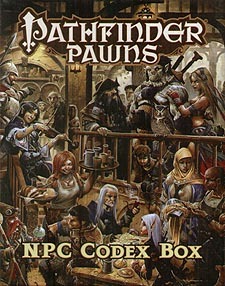 Whether they be vile villains, able allies, or anything in between, the characters of the Pathfinder Roleplaying Game NPC Codex come alive on your tabletop with this box-busting collection of more than300 character pawns for use with the Pathfinder Roleplaying Game or any tabletop fantasy RPG. Printed on sturdy cardstock, each pawn contains a beautiful full-colour image of a character from the NPC Codex, as well as common animal companions, and numerous never-before-illustrated characters. Each cardstock pawn slots into a size-appropriate plastic base, making it easy to play alongside traditional metal or plastic miniatures. With multiple pawns of the most useful character allowing you to create every single encounter from the NPC Codex's encounter groups appendix, the NPC Codex Box is the best way to ensure you've got the right characters to push your Pathfinder campaign to the next level.